which gives our patients access to excellent care. Apply our knowledge and skills in order to provide high-quality regional medical care. Live up to our motto which is “Attending to the patient’s body and mind”, we aim to be a clinic which is trusted, respected and grounded in the community we serve. We provide courteous, heartfelt care, to improve patients’ quality of life by anticipating their needs and work to do our outmost to convey our sincere desire to give each and every patient the best possible care. We are a clinic which provides patients’ with a safe and comfortable atmosphere in which staff members work in harmony on behalf of the patients and the clinic. 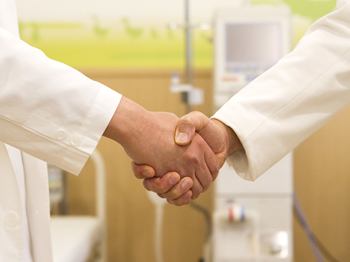 We are a specialized clinic for kidney and urinary organs. 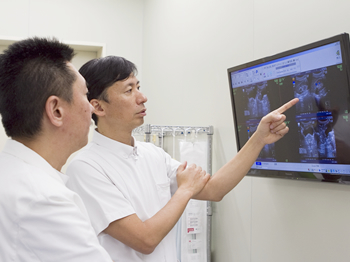 Two full time specialists in Urology, Nephrology and Cardiology cooperate with each other under the practice of the chief director of Iida Clinic, who is a pioneer of local dialysis medical treatment. For instance, blood in the urine can be caused by urinary organ failure or kidney failure. In such cases, we can examine patients and give more accurate treatment by employing the expertise of specialists within in the clinic for accurate diagnosis and subsequently the best care options. When we first started administering dialysis treatment, there was a considerable time commitment required and many physical demands the patients needed to make in order to receive treatment. Since then, we have considered ways to reduce the time burden on our patients as much as we can by consistently putting the patients’ comfort first by making the use of the most efficient medical devices and instruments for examination and treatment in the clinic facilities. Also, we respect patients’ privacy and are conscious about their comfort in the air conditioned consultation and medical care rooms. With guidance in making fitness and nutrition programs, we consistently value the patients’ quality of life and want to provide them with the finest possible medical care. 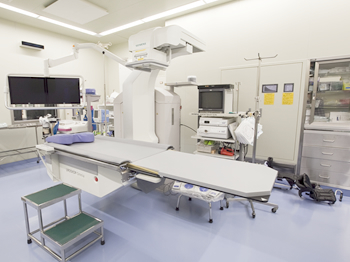 Our state of the art facility is one of the means for patients’ comfort. As we state above, in addition to introducing the latest medical facilities to patients, we improve the patients’ comfort in new and innovative ways. The café lounge affiliated with the dialysis room, is expertly designed by our interior coordinator for utmost patient comfort. Our common room, waiting room, and biotope (a water garden providing a living place for a specific assemblage of plants and animals) in front of the clinic entrance are constructed for the purpose to make patients feel comfortable. In our effort to be “eco-friendly” we employ the concept of “Smart Clinic”, which is thoroughly conscious about the environment and on using energy efficiently.